Solid Business Practice or are The Colts Being un-loyal? It’s hard to believe after all the accomplishments Peyton manning has put under his belt; the Indianapolis Colts would simply yet untimely relinquish his duties as quarterback. As of just one season ago Peyton threwfor 4,700 yards, 33 touchdowns, had a 64.9 completion percentage; ranking withthe top quarterbacks in the NFL. Most think this is a difficult situation toovercome, but that’s not quite the truth. After breaking down the facts, it maybe an easier decision than many believe. Let’s put this into perspective; The Colts have had one ofthe best Quarterbacks of all time playing for them since the 1998-1999season. Now That Peyton has been struckwith the injury plaque and is approaching 38, it seems to be the best business decisionon the owner’s behalf to cut ties with their all pro QB. Letting Peyton go isespecially easy due to the fact that they will owe Peyton roughly 30 million dollars at the beginning of next season, if he were to comeback as a Colt. So not only is Peyton Manning not getting any younger; the colts will also be paying out millions of dollars to a quarterback they are unsure can still play competitively in the NFL because of three neck surgery’s in the last year. Now this is where things get tricky. Are the Indianapolis Colts tempted to part ties with Peyton just because of his age and unsure future? Or do the Colts see this as an easy out, so that they can land a brandnew franchise quarterback in Andrew Luck and start fresh with their 2012-2013 NFL seasons. We as NFL fans have seen this exact situation play out before.There are two quarterbacks that know this situation all too well. The legend Joe Montana, after he gave the better years of his career to the San Francisco 49’ers;Montana was traded to the Kansas City Chiefs. This being before my time I’m unsure of the repercussions felt from this blockbuster deal. Although my mind leads me to believe it rocked the Bay area as do many places when their top quarterback is traded from their team. There is also Brett Favre, which Ibelieve is the most recent situation similar to Peyton Manning’s. Brett was tradedto the New York Jets after the Green Bay Packers attempted to force him intoretirement but Brett felt that he still had more in the tank, so he moved on.This sent shock waves through the Green Bay Community, but soon enough a young quarterback named Aaron Rodgers would step in and do away with any Favre fanatics. So as you can see this is nothing new to the NFL. Many top notch quarterbacks have been traded away from their team that they have grown so accustom to. Being loyal is not something that always plays out the way it should, when dealing with the business aspect of the National Football League.The owner must do what is right for the team not anybody else. Jim Irsay writes the checks each month, not the fan’s or media outlets. It’s a simple formula I believe Jim Irsay has on his mind; Out with the old, in with the new. 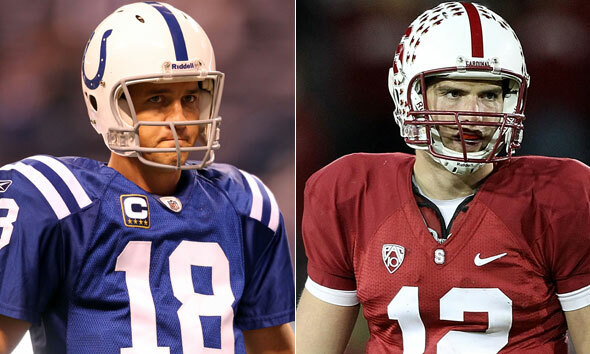 So I leave you with this question; Who is your pick, Peyton Manning or Andrew Luck?